How to create a Medical Leave Application Letter ? 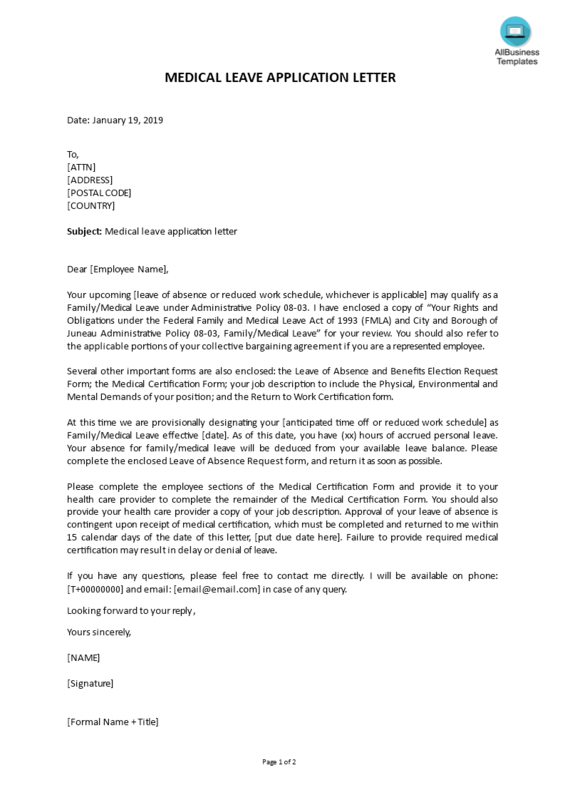 An easy way to start completing your document is to download this example Medical Leave Application Letter template now! We provide this template to help professionalize the way you are working. Our business and legal templates are regularly screened and used by professionals. If time or quality is of the essence, this ready-made template can help you to save time and to focus on the topics that really matter! Using this template guarantees you will save time, cost and efforts! Completing documents has never been easier! Download this template now for your own benefit! Medical Leave Application Letter (Date) (Employee Name) (Employee Address) Dear (Employee Name): Your upcoming leave of absence or reduced work schedule, whichever is applicable may qualify as a Family/Medical Leave under Administrative Policy 08-03.. Check our our collection of Leave of Absence templates suitable when you want to apply for a short leave or long leave from work or school.